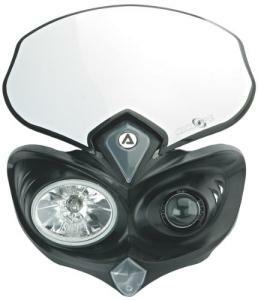 Finding a cool and nice performing headlight for your bike can be a pain. Thankfully the folks over at Acerbis have aimed to take that hassle out of picking new headlights with its universal Cyclops light unit. The main thing that really stands out about the Cyclops is that it is approved for all off-road and street-legal bikes. So not only can you hook it up to your woods-racer, you could also throw it on your street fighter and be ready to roll. That being said, the Cyclops does have an obvious off-road feel to it as it incorporates a number plate into the unit. It is very popular with the dualsport Suzuki DRZ crowd. The DOT and SAE-approved headlight features adjustable angles, a polycarbonate lens for protection when hitting the trails, heat-resistant plastic, and separate 55-Watt halogen sot and flood lights. The lights themselves are very bright and provide good coverage. The universal fit is a great feature. The kit attaches via heavy-duty rubber straps, and connecting the wiring is a breeze. All in all, this is a popular and functional upgrade that would serve as a good replacement light for any bike.